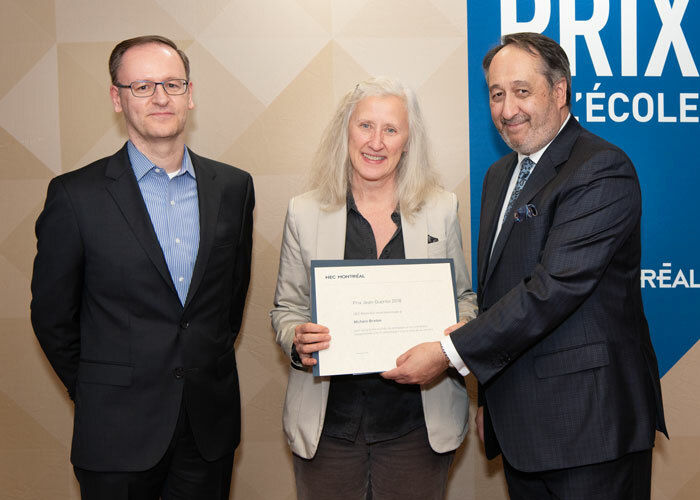 Olivier Bahn, Director of the Department of Decision Sciences, Michèle Breton, winner of the Jean-Guertin Award, and Michel Patry, HEC Montréal Director. The School has saluted the exceptional career and teaching contribution of Professor Michèle Breton, by giving her the Jean-Guertin Award for Teaching Excellence at the annual award ceremony on November 28. When she arrived at HEC Montréal in January 1977 as a lecturer, Michèle Breton very quickly saw that she wanted to devote her career to teaching. “I was captivated by my students’ attitude, their enthusiasm and their interest in learning,” she says in describing her early days at the School. She then became a faculty lecturer before being appointed assistant professor in 1986, associate professor in 1989 and full professor in 1994. In 2013, she added Director of Academic Affairs at HEC Montréal to her duties. Over her 40 years at the School, Professor Breton has taught a huge variety of courses: 32 different courses, in fact, in five programs, for an average of 5.6 courses per year of teaching. In addition, Professor Breton has supervised or co-supervised 58 Master’s students and 20 PhD students, in addition to the 7 PhD candidates she is currently supervising. “For me, supervising a student doesn’t mean just helping him or her produce a thesis or dissertation that advances knowledge. (…) I devote an enormous amount of time to teaching the ‘trade’ to the students I supervise (and even to others) – showing them how to correct their texts, how to prepare and present scientific papers, how to write grant applications, and sometimes how to organize their lives,” she explains. Professor Breton’s colleagues also attest to her generosity, enthusiasm and energy, emphasizing the quality and consistency of her contribution to teaching in general and to her courses, programs and teaching materials. Indeed, she has designed no fewer than 37 courses. This includes the doctoral course in dynamic optimization, which she has given every year for over 20 years. She has also developed or helped reorganize many programs and created countless documents, notes, case studies and other teaching materials for students.